Somehow we’re entering September and back to school time in just a few days. I’m not really sure how to it happened but before we know it this heat will be gone and we’ll all be wearing our heavy jackets and boots while wondering if we’ll ever not be freezing again. Along with the cold temps and school days, snacks in between classes or when you get home from the day seem to go hand in hand. Whether you are sending yourself off to school, or sending kids off to school, whether its for college classes or another year in high school — snacks are going to become a daily part of your life again. Here are 7 of my favorite snack recipes for these times, or any time you are looking to snack. This is kind of an odd snack when you first look at the ingredients. 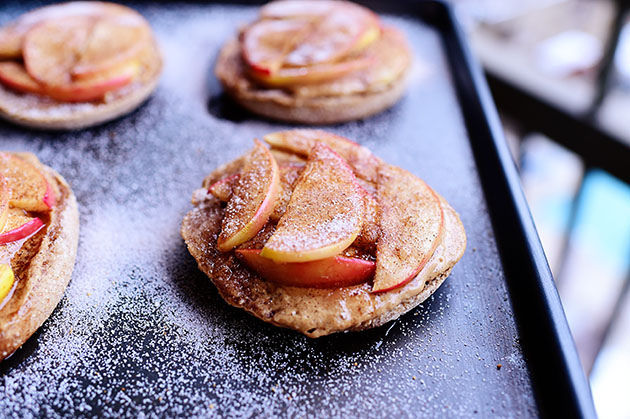 What do english muffins, apple slices, peanut butter, and cinnamon sugar have to do with each other? And who puts apple slices on bread? But once you stack everything together and stick it in the oven for a few minutes you are treated to, well, a delight. The muffin toasts, the apples warm up and caramelize a bit with the sugars, and the peanut butter melts into it all. You can use any sort of english muffins but my favorite for this are the 100% whole wheat variety. Not only does this make a pretty healthy snack, but the heartiness of the wheat muffins is excellent. You could buy these in a store but when they are so simple to make at home, there’s really no need. When you make ’em yourself you get to customize the bars to your tastes and you’re able to avoid extra, weird ingredients that don’t need to be in non store-bought granola bars. I’ve tried – and keep trying – many recipes but this is one that I always come back to. Super easy, with no strange ingredients, and feel free to omit the nuts if you’re allergic or switch out the dried fruit for other types that you like. Don’t panic if these bars don’t stick together, it happens, and they are just as delicious as loose granola. These bites are not only great for after school snacks, but great for a pre or post-workout snack as well. They come together in a matter of minutes because they are no bake and contain simple, healthy ingredients. I have a feeling once you make these once, they’ll turn into a regular staple in your life. The chia seeds in the bites are for added health benefit but they aren’t necessary, so if you can’t find them in the grocery store (or don’t feel like spending the money, they can be a little expensive) don’t worry about it — just omit them. Smoothies are a fabulous any time treat but make an especially great after school or between classes treat. If you want to whip these up on the spot, it doesn’t take long, but I suggest making a big batch on one day and then pouring them into jars and freezing them individually. Then just remember to take the smoothie out a few hours before you want to eat it so it can defrost. This works especially great if you have busy weekdays but don’t mind spending some time on the weekends food prepping for the week. Add these to the list of snacks that you’ll need to set aside a few hours to make one day but can then enjoy for many after. There are a number of steps to making these but once you taste them I don’t think you’ll be caring much. I find them pretty filling, so if you make a batch of these on the weekend you can snack on them all week long. The most complicated part here is the initial step of working with yeast but it really isn’t anything to be feared, just make sure your water is warm and everything should be fine. Did you just wince when you saw pumpkin spice? Can you you believe it’s time for that already? Better believe it. If you are someone who doesn’t tire of pumpkin or pumpkin spice no matter how overblown it gets (like me) then make this mix just to have around the house. This is a great combination of sweet and salty with a fall spice twist, and it’s another recipe that you can make a huge batch of on one day and eat for many after. Word to the wise, though, separate the portion that you want to eat — don’t just eat it straight from the container. The container will be empty before you know it if you go with the former. The rest of these snacks are on the healthier side, perfect for every day eating, but some times you don’t want a healthy snack and are craving something much sweeter and more decadent. I like to make a batch of this dough, separate it into cookie sized pieces, and keep it in the freezer in a plastic bag. Then just take out the number of cookies you want to eat and stick them in the oven when your ready – no defrosting! 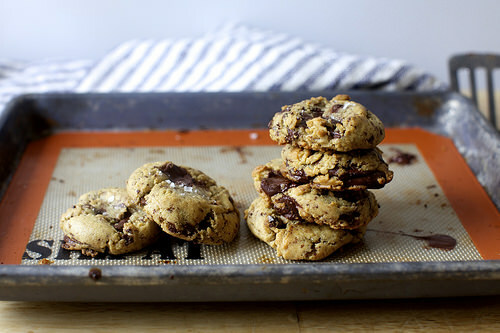 This way you can have a fresh baked cookie pretty much on demand. Is there a better snack in the world than that? What are you favorite homemade snacks? Yummy! I love anything with apples. I will starting my baking goods soon. Can’t wait!